I have self-diagnosed myself with ‘blackberry thumb’ (BT)! Bear with me and my personal minor health story. This is quite exciting as I have never owned a blackberry but I admit to being a recent convert to texting, perhaps tripling the amount of texting that I do in the last month. Blackberry thumb is basically pain in the thumb from excessive texting. Isn’t it the most delicious diagnosis? You imagine a bruised black thumb and you kind of want to lick it and I much prefer the label to others suggested such as ‘teen texting tendonitis’ ‘wii-tis’ and ‘playstation thumb’. I thought it was quite exotic until I read that 1 in 6 British teens complain of hand pain while texting. With iPhone sales alone around 120 million a year and even more androids, there will be more aches and pains. It is predicted that there will be 2 billion smartphones in use by 2015. Blackberrys were invented before iPhones otherwise it might have been called iPhone thumb which sounds weird. If you read the various case studies in the literature, most refer to a thumb tendonitis or a joint arthritis. Maybe I am biased but my Blackberry thumb is a nerve irritation (an abnormal impulse generating site) in the dorsal nerve of the radial nerve (on the radial side). I think this is the first description of neurogenic blackberry thumb. I suspect (as in many other parts of the body) that peripheral neuropathic problems are often missed. Check out the image of my thumb in Figure 1. The spotted part is where the thumb is slightly numb. I know numb is numb, but this area is slightly numbish. If I press the spot where the arrow is, the numbness increases and it can zing into the base of my nail – more of a thudding feeling than a pain. Of course I tried out an active radial nerve neurodynamic test – reaching down with an internally rotated shoulder and with my thumb flexed. This gives a real thudding feeling into the nail and I was wondering if it could neurogenically inflame the nail bed. However, it doesn’t do it always when I try and finds the thudding position again. This made me a bit frustrated at first and then I remembered that peripheral nerve problems often present with this unpredictability. The thumb looks exactly like the other thumb i.e. no swelling or colour changes. Did my fat thumbs cause it? I think it is from texting with a firmly flexed thumb interphalangeal joint with ulnar deviation pressure. Because my thumbs are bigger and fatter than most, I flex, ulnar deviate and almost rotate the distal phalange to get a more angular edge of the thumb, ie near the nail to hit the right key. Check out my texting style in Figure 2. I think it will take a while for our thumbs to evolve to handle texting and by then there will be sure to be a better way of communication. Such flexion will give quite a local stretch of the nerve and it is the repeated unusual tweaking of the nerve that I think has caused this. 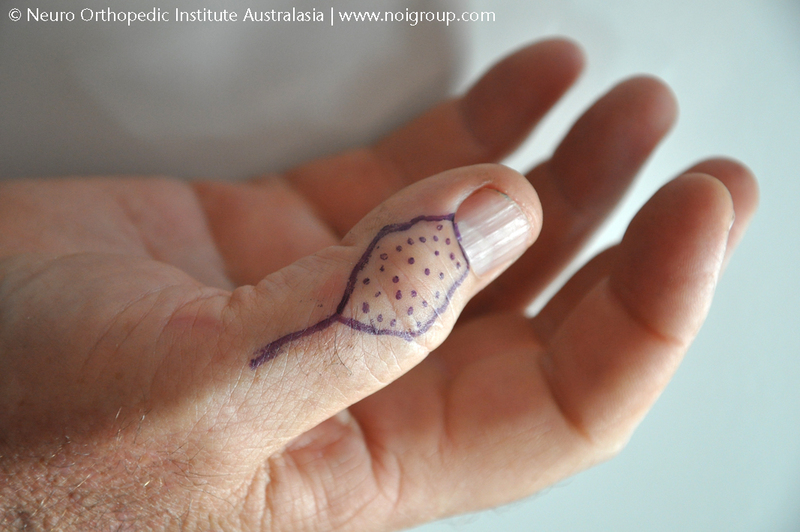 Older peripheral nerve entrapment books mention that compressive forces such as scissor use could cause a similar neuropathy, but this is more a repetitive traction injury which has not been mentioned before in regard to blackberry thumb. I would love to peek inside the thumb, take a look at the nerve and then peek inside the nerve. Tiny nerves, especially in the extremities are very mobile – they have to be so we can move so much. Look at the dorsal side (back) of your thumb. Flex it and imagine how much the nerves just under the skin have to glide and stretch. I think I overdid this a little and I may have stretched a bit of myelin, maybe peeled some of the Nodes of Ranvier in outerlying fibres apart, there must be a little bit of intraneural inflammation and perhaps a bit of ion channel upregulation. The main issue here is that peripheral nerves and their injuries and problems are missed ‘out there’. The brain is now so trendy – peripheral nerve research or even clinical consideration, is rare these days. Many people still think a peripheral nerve is like the cord on the television set, i.e. if you cut it, it stops working. Yet peripheral nerves are reactive, adapting, mobile parts of our bodies which deserve to be included in a wider view of the neuromatrix. Does my BT need treating? Some of these minor problems can go onto chronic problems. I think as long as you know about it, and don’t panic that you have some rare neurological disease this should be OK. 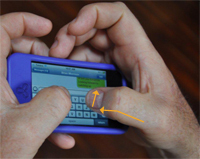 I have adapted my texting techniques, in particular to using my index fingers which are more designed for dextrous work. I am trying some active radial nerve mobilising techniques which include the thumb and I am expecting that it will slowly go away in a month or so. 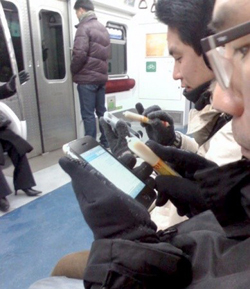 Or you could take on texting with a sausage – an adaptation that has spread throughout South Korea and Russia to stop frostbite in the winter time. In last month’s NOI Notes we asked “Who is missing out on modern pain treatment?”. We had an overwhelming response, some detailed, and some pleading for help. Thank you for your responses. We can’t answer all of them, but there is no doubt that stroke, pelvic pain, face pain, post hepatic neuralgia, radiotherapy pain, post mastectomy pain, and fibromyalgia all need an outing. • bringing researchable ideas from the clinic to the fore. We can’t take questions from individual sufferers nor can we provide individual treatment advice, however, patients may find reading the clinically orientated stories helpful and we hope that you can see that by providing these stories we are helping clinicians and indirectly helping you. • discussion of pain problems that most clinicians have given up on. All helpful, respectful, constructive and reasoned comments are welcome. If you are not sure, submit your proposed noijam post to kat@noigroup.com for a friendly chat.